Last week, Farmer Margie told me that she was short-handed and needed volunteers to help pack shares. I offered to help, and rounded up my new buddy Nathan (who wants to be a tractor mechanic when he grows up), and he brought along his mother Tunie. Farm manager Muriel invited Christina, and we four volunteers joined the packing line in the barn at eight last Friday morning. Kenna and Nathan make cabbages fly. Before we could start packing the actual shares, the reefer truck had to be unloaded. It was full of vegetables from Worden Farm. The first challenge was a large bin full of cabbages, too heavy to lift fully loaded. 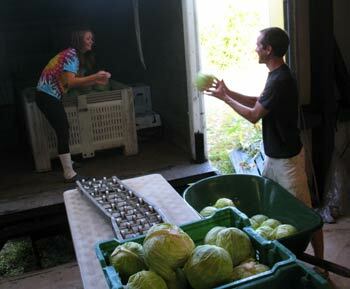 Intern Kenna and Muriel climbed aboard and tossed cabbages fast and furious to Nathan and me. We caught and stacked them into wheelbarrows, which went to the head of the packing line. Muriel determined which veggies went in which order on the line. The heaviest items get packed first and go in the bottom of the share box. The lightest things go on top, where they won’t get crushed. The actual packing went fast and easy. Margie and Christina packed cabbage and beets. Tunie added green beans and spring onions. I was next on the line. With my left hand, I reached for the box coming down the rollers and put in a bunch of kale. If the cabbage was big (and some were monstrously huge), I packed a smaller head of lettuce. If the cabbage was small, I put a bigger head. Then I pushed the box to Jesus on my right, who added mushrooms, closed the boxes and stacked them. Nathan loaded the boxes into the truck. Kenna was the runner, replenishing supplies of veggies and empty boxes. Thanks to volunteers Nathan, Tunie and Christina for their hard work!